"There are no ordinary lives," said Ken Burns of those who served in a global cataclysm so momentous that the filmmaker simply entitled his 2007 documentary "The War." Many who served in so many different ways during World War II are gone now. Some took their stories with them. But not this one. As his B-17 bomber dropped like a battered pinata -- its nose blown off, wings and fuselage riddled with holes, two of four engines dead -- navigator Richard Hansler and the rest of the 10-man crew had a decision to make on that unlucky 13th day of September, 1944. Ride it out and hope the plane could limp back to home base of the 483rd Bomb Group in Italy, or "Prepare to Bail Out!" -- the title of a recently published book written by Hansler, 85, of Pepper Pike. They chose to jump into German-occupied Czechoslovakia, near Poland, where Hansler and four other crewmen who had eluded capture faced another, tougher choice. Turn themselves in and finish the war in a POW camp, or join the Polish partisans and face probable execution if captured. The choices had been much easier, or at least less potentially lethal, for Hansler when this son of a Lutheran minister, raised in Milwaukee, opted to join the U.S. Army Air Forces in 1943 rather than wait to be drafted. He wanted to be a pilot, but problems with his depth perception ruled that out, so he became a navigator instead. He joined a squadron operating out of Italy with the Fifth Air Force, hitting targets in Germany and Romania. Just before arriving, half the planes in the squadron had been shot down, and Hansler's crew was assigned to a tent formerly occupied by one of the lost crews. It was a grim welcome to the world of aerial combat, where bombers flew at freezing altitudes, through hordes of German fighters and clouds of antiaircraft fire. Hansler took to sitting on metal machine-gun ammo boxes for a little extra protective "armor" below the waist. He also developed an appreciation for protection provided by the Tuskegee Airmen -- black aviators who flew fighters escorting the bombers -- even though they had a habit of buzzing the bomber crews' tents at treetop level, just for kicks. "They'd scare the heck out of you, but we were really glad to see those guys when we'd rendezvous before a bomb run," Hansler said. His B-17 flew 24 missions without a single crewman wounded or significant damage. At some point Hansler was awarded an Air Medal. He doesn't remember why. "For the fact that I was still alive, I guess," he said with a shrug. Then, during an attack on a synthetic oil refinery in Blechhammer, Germany, Hansler's plane had just dropped its bombs when the aircraft was rocked by a huge blast. Hansler figured antiaircraft fire had hit the bombs as they fell. Other crewmen thought another bomber had slipped below them and flown into the falling payload. Whatever the reason, the crippled bomber dropped out of formation and was quickly pounced on by German fighters. Hansler and his crew hit the silk. Five were immediately captured by the Germans. Hansler and four others were rescued by Czechoslovakians who hid them until the airmen met with Polish partisans and were invited to join the underground. They accepted, were given guns and spent the next four months roaming the mountains, mostly trying to avoid getting shot or captured. "I greatly admired them," he recalled. "It was at great risk to their lives that they provided us with protection." Courageous, yes, but not entirely competent, as illustrated in Hansler's recollection of one action involving an attempted partisan ambush of German troops. "Unfortunately, these rather poorly trained young kids, gun-happy, started shooting before the Germans ever got to where we could see them," he said. "Then the Germans started shooting and nobody knew what they were shooting at." The Germans beat a hasty retreat from the bloodless battle. There also was brutality and sadness along the way. Hansler recalled walking through a Polish village that the Germans had burned to the ground and massacred nearly all of its inhabitants. In his book, Hansler wrote: "It was a weird sight, this village of the dead with its gravestone-like chimneys standing ghost-like in the half light of the stars." The experience changed him long after he and the other airmen met with advancing Russian forces and eventually made their way back home. "Things like that [massacre] made me really antiwar, I guess," said Hansler, who became a peace activist after the war. He said he also got involved in the civil rights movement, reflecting the admiration and respect he developed for the Tuskegee Airmen. Hansler attended Capital University in Columbus, where he met his wife, Wanda, and together they raised four children. He earned a bachelor of science degree in physics from the University of Chicago, and a doctorate from Ohio State University before working at General Electric's lighting division at Nela Park for 42 years. Hansler is currently director of the Lighting Innovations Institute at John Carroll University, where his work has encompassed studying the effects of light on health. This includes development of light bulbs and glasses that filter out blue light and, according to Hansler, enhances the body's melatonin production, potentially reducing sleep loss and risk of cancer. 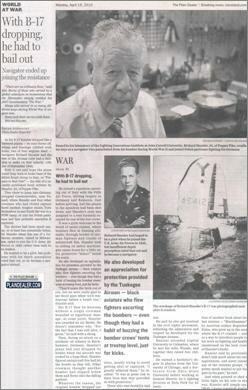 He said his book was prompted by recent publication of another book about his last mission -- "Blechhammer" by Austrian author Boguslaw Zieba, who grew up in the area where the B-17 crashed -- and as a way to introduce people to his work on lighting and health (mentioned on the back cover of Hansler's book). Hansler said he previously didn't talk much about his war experiences, and never joined any of the veteran's groups. "I pretty much wanted to put the past in the past," he said. And when pressed to shed a little light on his role in the war, Hansler will simply say, "Well, I guess somebody had to stop Hitler, and I was glad to be a part of that because he certainly was a monster."